(Nanowerk News) Even as robots become increasingly common across different parts of our world, they remain incredibly difficult to make. From designing and modeling to fabricating and testing, the process is slow and costly: even one small change can mean days or weeks of rethinking and revising important hardware. But what if there was a way to let non-experts craft different robotic designs -- in one sitting? Researchers from MIT's Computer Science and Artificial Intelligence Laboratory (CSAIL) are getting closer to doing exactly that. In a new paper, they present a system called "Interactive Robogami" that lets you design a robot in minutes, and then 3D-print and assemble it in as little as four hours. One of the key features of the system is that it allows designers to determine both the robot's movement ("gait") and shape ("geometry"), a capability that's often separated in design systems. "Designing robots usually requires expertise that only mechanical engineers and roboticists have," says PhD student and co-lead author Adriana Schulz. "What's exciting here is that we've created a tool that allows a casual user to design their own robot by giving them this expert knowledge." The paper, which is being published in the new issue of the International Journal of Robotics Research ("Interactive robogami: An end-to-end system for design of robots with ground locomotion"), was co-led by PhD graduate Cynthia Sung alongside MIT professors Wojciech Matusik and Daniela Rus. 3D-printing has transformed the way that people can turn ideas into real objects, allowing users to move away from more traditional manufacturing. Despite these developments, current design tools still have space and motion limitations, and there's a steep learning curve to understanding the various nuances. 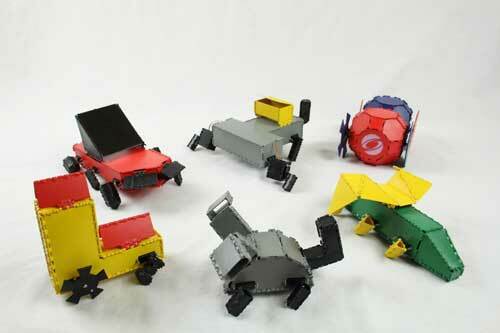 Interactive Robogami aims to be much more intuitive. It uses simulations and interactive feedback with algorithms for design composition, allowing users to focus on high-level conceptual design. Users can choose from a library of over 50 different bodies, wheels, legs and "peripherals," as well as a selection of different steps ("gaits"). Importantly, the system is able to guarantee that a design is actually possible, analyzing factors such as speed and stability to make suggestions and ensure that, for example, the user doesn't create a robot so top-heavy that it can't move without tipping over. Once designed, the robot is then fabricated. The team's origami-inspired "3-D print and fold" technique involves printing the design as flat faces connected at joints, and then folding the design into the final shape, combining the most effective parts of 2D and 3D printing. "3D printing lets you print complex, rigid structures, while 2D fabrication gives you lightweight but strong structures that can be produced quickly," Sung says. "By 3D-printing 2D patterns, we can leverage these advantages to develop strong, complex designs with lightweight materials." To test the system, the team used eight subjects who were given twenty minutes of training and asked to perform two tasks. One task involved creating a mobile, stable car design in just ten minutes. In a second task, users were given a robot design and asked to create a trajectory to navigate the robot through an obstacle course in the least amount of travel time. The team fabricated a total of six robots, each of which took 10 to 15 minutes to design, 3 to 7 hours to print and 30 to 90 minutes to assemble. The team found that their 3D print-and-fold method reduced printing time by 73 percent and the amount of material used by 70 percent. The robots also demonstrated a wide range of movement, like using single legs to walk, using different step sequences, and using legs and wheels simultaneously. "You can quickly design a robot that you can print out, and that will help you do these tasks very quickly, easily, and cheaply," says Sung. "It's lowering the barrier to have everyone design and create their own robots." "These tools enable new approaches to teaching computational thinking and creating," says Rus. "Students can not only learn by coding and making their own robots, but by bringing to life conceptual ideas about what their robots can actually do." "This tool enables rapid exploration of dynamic robots at an early stage in the design process," says Moritz B?cher, a research scientist at Disney Research who was not involved in the research. "The expert defines the building blocks, with constraints and composition rules, and paves the way for non-experts to make complex robotic systems. This system will likely inspire follow-up work targeting the computational design of even more intricate robots."